A series FX loop with variable level control and bypass, DI output with Ground Lift switch, and remote footswitchable tuning facilities complete the line up. The front panel has options for Gain Boost and Pad to cover all instruments whether passive or active, or just for ultra-clean or overdriven rock styles. The EQ options cover a wide range from switchable LF voicing cut and boosting, HF voice boosting and EQ depth to expand the effectiveness of the valve-driven Treble and Bass EQ circuit. The EQ system controls (Treble, Middle, Bass) each have a 3 position Range switch that re-configures each control for frequency response and interaction with the other controls, giving a very wide range of tonal variation simply and repeat-ably. Wharfedale Musical Instruments designs and builds its own loudspeakers from the ground up (including cones and all hardware), thus each speaker in the WHB range has been specifically made for that product – something that no other company that we know of can claim, thus resulting in a no-compromise approach to our sound quality. For instance, our titanium high frequency horn has a special angular flare projecting the sound not only straight ahead into the audience – but, uniquely upwards into the player’s hearing. The WHB200C combo is designed for great bass sounds in a small package, ideal for small club stages, but uniquely has a built in switchable 300Hz crossover and output jack to connect to the WHB115 15” cabinet for use as a sub-woofer giving a deeper bass output for use on bigger stages. 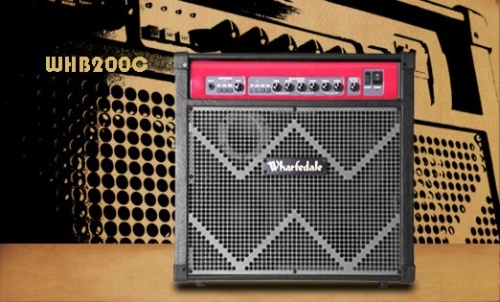 Thus extending, simply and cost effectively, the versatility of the combo with just the addition of one cabinet – making an easily transportable and flexible working bass player’s stage rig. All cabinets are solidly built from plywood and all feature extensive internal bracing for vibration free performance down to the lowest notes. The classy good looks come from all Wharfedale proprietary cabinet hardware. 200 watt hybrid amplifier 2x10" + horn Bass combo - special angled cabinet for session and club use where good directional sound is required.